Rinse and image appears in minutes. 25 sheets of specially treated paper per pack. 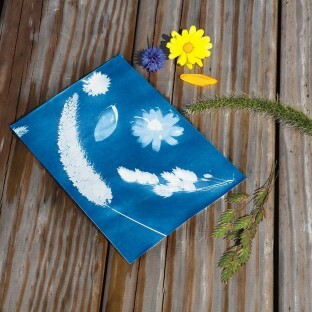 Produce beautiful prints from natural or man-made objects by exposing this specially treated paper to sunlight. Rinse in water and image appears in minutes. Sheets measure 8-1/2" x 11". 25 sheets per pack. Be sure when you prepare for the project there is no sunlight when taking it out of the package. This will destroy your project and cause it not to image the things that you are trying to capture. We purchased several crafts from SS Worldwide for the churches vacation bible school crafts . The crafts avliable from VBS material provider were very costly and every year we had issues. This year craft time was a breeze and we could incorporate each one with the lesson.